Learning to kitesurf can be a real challenge, and before your first lesson, the expectation of what you are going to do can be daunting. But, it doesn’t haven’t to be. We’ll cover what you need to know before, during, and after your lessons, setting your expectations and preparing you for the start of your kiting journey. Safety: A kitesurfing kite can seriously hurt or kill you if you don’t know what you’re doing. Worse still, it’s easy for you to seriously hurt a member of the general public. If you lose control of your kite then someone 50m away can suddenly be very much involved. Although there is potential for kitesurfing to be dangerous, please don’t let that put you off learning. Once you understand how a kite works, how to fly it properly, and the safety systems available, much of the danger goes away. Think of it like driving lessons. Without them, attempting to drive a car down a busy street would probably cause an accident, but with them, the potential danger is dramatically reduced. It’s the same for kitesurfing, have lessons and be in control. Confidence: It’s far quicker and easier to learn when you have an experienced instructor there to offer advice and build your confidence. Focus: When you learn you’re going to crash your kite a lot. It’s part of the process and something you shouldn’t worry about. So, it’s better to do that when it’s a school’s kite and lines that are getting battered rather than your newly purchased kit. Save yourself the hassle and the cash! Learning with an experienced instructor will make your first days more enjoyable and get you up and riding far quicker. Every beginner wants to get up on the board, but ultimately what really matters is learning to fly a kitesurfing kite properly. Your kite skills are what will hold you back, not your ability to control the board, that will come far more easily. So, put the time in flying a kite on the beach and then in the water, body dragging. Getting used to the power and subtleties of flying a larger inflatable kite will positively impact all aspects of your kiting journey for years to come. Lay the groundwork, be confident flying your kite and your first water starts will be smoother, you’ll have fewer crashes and longer first runs. What can you do to get more from your lessons, so that when you have access to an instructor you are able to make the most of them? Well, there are a few areas you can focus on before your lessons to give you a leg up. 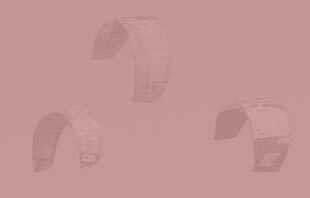 Flying a trainer kite will have a massive impact on your general kite awareness. These are usually foil kites which are different to the inflatable tube kites we use when kiteboarding. These kites are easier to fly, they depower completely making them easy to recover when you make mistakes and are relatively cheap. Some instructors will lend you a trainer kite before your lessons to give you time to practice. It’s worth being aware that trainer kites are best used with a bar, rather than handles, this makes the kite handling more alike to a kiteboarding kite. If you have a kiteboarding friend, ask them to spend an hour with you to get you started and then you’ll have the confidence to play around with the kite on your own. You may also find the first 3 videos in our Beginner Collection useful before your lessons, to start understanding some of the key terminology and concepts, making it less overwhelming during your lessons. What are you going to learn in your lessons? And how quickly will you progress? The order and style of teaching may differ between schools, largely depending on the wind and water conditions where they teach but, on the whole, the core skills taught are the same. What has a bigger impact is your experience and natural aptitude to flying a kite – some people take hold of the bar and quickly find themselves flying the kite around the sky, others can’t help but crash repeatedly. These people may need a bit more practice and coaching to start feeling more confident with a kite. Inevitably lessons will begin with some form of land based instruction – if you already have experience of flying a kite then this stage may be kept shorter, becoming an opportunity for your instructor to evaluate your skills. You’ll be introduced to inflatable kites, how the bar and safety systems work and how they differ to any trainer kites you have already flown. An important part of this first stage is properly understanding the key concepts – the wind window, powerzone and all the safety elements that will ensure yourself and those around you are not put in danger when flying a kite on the land or sea. Now it’s time to enter the water and better understand the power that a kiteboarding kite can offer. You may start by doing tandem body drags with your instructor before you are given the opportunity to start body dragging on your own. This is an essential skill, allowing you to experience flying the kite in different areas of the powerzone and wind window. You’ll find you can generate far more power than you would on the land and practice techniques that you will eventually use with a board, but without it getting in the way. Every kiteboarder uses body dragging in nearly every session to recover their board when they crash, hence why instructors are strict on students mastering this fundamental skill before using a board. This is also the stage when you will learn how to water relaunch the kite – you will crash your kite a lot when learning, so having the knowledge and confidence to relaunch will remove some of the fear of crashing it. Alongside this you must learn how to self-rescue – it’s not always possible to relaunch, so learning how to get safely back to the beach is essential. The Progression Self Rescue video is now available to watch for free online. You can also view the full Water Relaunch & Self Rescue video in the Progression Player App.The Body dragging and the Launching and Landing videos will both be helpful during this stage of your lessons too. The waterstart requires you to control the kite with one hand whilst using your other hand to move the board and get both your feet into the footstraps. It’s harder than it looks and different instructors will use different techniques to help you learn to stay balanced whilst you get setup. Then it’s time to get out of the water and up on the board – there are a lot of different elements to master and coordinate requiring practice and a probably a few crashes. Once up on the board, you’ll work to balance the power from the kite against your body weight, and the position of the board to drive you forwards. For many people, this is where your lessons may end and you’ll go it alone, but don’t be put off having more lessons if you find having an instructor on hand gives you the confidence to progress quicker. Your instructor can hopefully advise you on the best equipment for your weight and home spot. 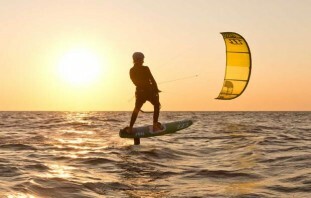 Check out our blog posts on Kiteboards and Kites to better understand what equipment is on offer. You should have third party insurance wherever you are kiteboarding around the world. It’s the responsible thing to do and will ensure if you hurt anybody else whilst kiteboarding, you are covered. Always remember that you can go back to body dragging if you have a bad crash, if you start kiting at a new beach or in conditions that you are not used it. It’s the safest way to regain confidence and keep improving your kite skills. You’ll want to kite as much as possible but, in the early days, it’s worth practising in the right conditions, those that will allow you to improve easily, gain new skills and are less likely to knock your confidence or put you in danger. 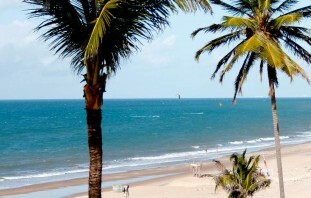 Generally, 12-20 knots is the ideal range, with a wind that is not gusty. Flatter water is better – if you have no choice but to ride where there are small waves, body drag out past any waves before you start water starting. Always speak to experienced riders at any new beach before you start kiting. Ask their advice about the conditions and what kite size to use. The people who improve the quickest are those that get out regularly, but also that spend time observing others learning. Getting a kite buddy – someone who is at the same beginner stage as you – is a great way to learn safer and quicker. One of you rides whilst the other observes. That way the person with the kite has someone to help them with their board and land or recover their kite if they end up downwind or in trouble. During a session you can swap back and forth, helping each other, learning from each other’s mistakes, and getting time between goes to regain your energy so you’ll be fully focused each time. If you don’t have a friend who is learning, ask your instructor or at your local club to find someone you may be able to buddy up with. This may be the most important advice you will get when learning to kiteboard. If you want to master the basics and get past the beginner stage then you need to commit 100% to these early days and go kiting anytime the conditions are right. Practice really is the only way forward – going once a month is not enough. If you can make learning to kitesurf your top priority for 3 months, blowing off other plans if kiting looks good, then you will maximise your time on the water and be riding upwind before you know it. At that point, you can choose your sessions more strategically or, more likely, you’ll become so obsessed that you’ll still drop anything to get out on the water. The advantage at this point is that you are now able to kite in lighter and stronger winds, giving you more options. After you’ve mastered the basics there are endless possibilities for different tricks you can learn or other styles of kite disciplines you can try, but for many, the first aim is learning how to jump high in the sky. Find out the path to your first jumps in our blog post – From Beginner to Booster – The path to your first kiteboarding jumps. We have lots of great blog posts, free videos and premium in-depth instructional videos that can help you throughout your life as a kiteboarder, but for now check out our Kiteboarding Beginner Zone for more resources that you might find interesting and helpful. 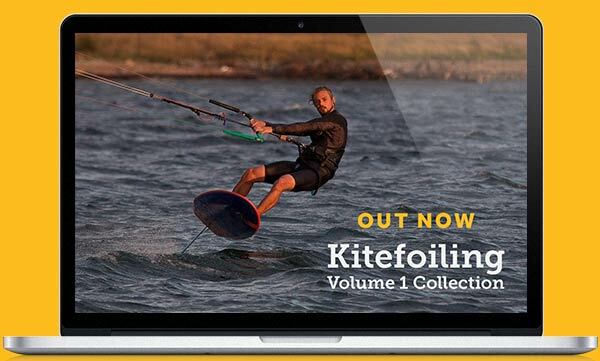 Our Kiteboarding Beginner Collection is the perfect complement to professional instruction. Ten videos that will help to build your understanding and confidence before, during and after your lessons.